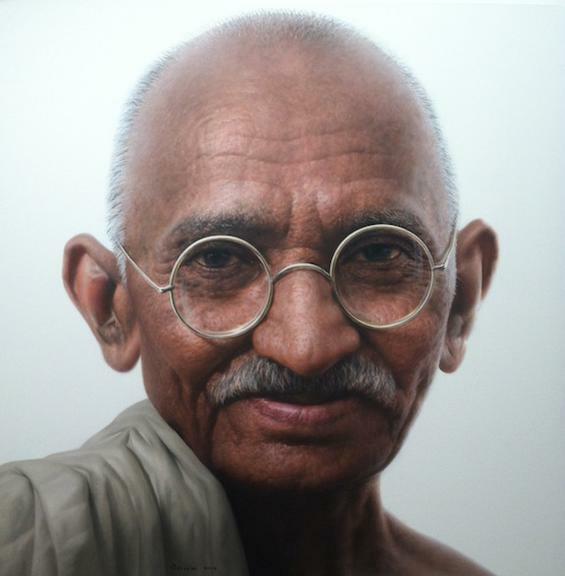 Many people think that Gandhi stands for vegetarianism, and passive resistance. Yet does he really? What did his stance on these topics really mean? During my own Ph.D. research on Gandhi, trying to grok his environmental perspective, I took this recommendation from the man himself as a requirement. I ended up going through the entire Collected Works of Mahatma Gandhi (every page of 103 volumes! And more!) and evolving my understanding of his mindset as I went. I didn’t stop there, but went on to India, to live 12 years in an ashram setting, seeking to absorb and understand the ethos and ideals that his example inspired me with, to raise my children in light of these ideals – more on that later. This article begins a series on clarifying Gandhi’s Earth Ethics. Gandhi covered a wild array of topics, each with an ideal and principle behind it. Throughout this series, I will endeavor to present the core kernel of these principles. To enable readers to be mindful of Gandhi’s instructions above, I will note his age at the time of the quotation, where possible. Like gravity, Earth ethics are the intangible laws which we hold as pure ideals, that govern the universe – the largest group we are a part of – whether or not we choose to be aware of them. Ideals we have an inner knowledge of through our conscience: truth, justice, loving kindness, duty. Morals are the means we employ to place ourselves in harmony with these laws, and morality is the responsibility a person takes for his or her thoughts, words and deeds. Understanding Gandhi’s perspective and thought is relevant to all truth seekers, which we all, in one way or another, sooner or later, become. Most people know of Gandhi’s political work, through Attenborough’s movie, history books, or through Dr. King, Cesar Chavez, Nelson Mandela, the Dalai Lama, to name some famous people who have sought to apply his ethical perspective in their own lives. Today, India’s Irom Sharmila Chanu of Manipur stands unparalleled, even by Gandhi, in her utter fidelity to conscience. On a nonviolent fast as protest for nearly 14 years, she claims Gandhi’s teachings have inspired her. Gandhi unified India, which was fragmented into princely kingdoms, not unlike Europe, into singular nationhood. He brought into national and then global awareness righteous, humane, and practical means to become free of the choke-hold of that early global corporate economic pattern – the British Raj. Gandhi stands as a beacon of hope for many as to the innate sanctity of the human heart, knowable through sincere integrity and effort. Somehow we regard him with reverence and awe; for he demanded of himself and went within that self where we all know we ought to go, but haven’t yet mustered up the gumption to go to, for whatever reason. He was not infalliable, and peering critics abound. At times he was arrogant, perhaps even full of himself, yet the ideals that he strove for, carried him forward and are synonymous with his name today. In this article, we look at the ideals, not the personality of Gandhi. Our present education and media has ignored the discussion of conscience. Yet this faculty within us is our most sacred possession. We must revive its study, explore its depths, and its pristine heights. In turning to support our children’s fidelity to their conscience, we will hail the advent of positive evolution for human society, and a wiser personal outlook upon life. It is our prayer that the continued discussion of these ideals will encourage us all to be fearlessly true to our conscience, to call out to conscience in each other, and through these means, to touch each other with the profound nobility of our human spirit. iiReddy, Dr.E.S.(Ed.) (1998). Mahatma Gandhi: Letters to Americans. Bharatiya Vidya Bhavan, Kulapati Munshi Marg, Mumbai:335.
iGandhi, M.K. (1956-1983) Collected Works of Mahatma Gandhi. Vol 77: 102 (1942-1944). Navajivan, Ahmedabad, India. iiiTendulkar, D.G. (1920). Mahatma: Life of Mohandas Karamchand Gandhi. Vol. 2. (7 Volumes). Ministry of Information and Broadcasting, Government of India, New Delhi..
ivIbid. Vol. 2:5 ( 1896-1897). vIbid. Vol. 83:241 ( Jan 20. 1946 – April 13, 1946). iGandhi, M.K. (1933) Harijan (a newspaper he started in India to spread his ideas). King, T. (Editor and Publisher), (2014). Neighbors. No.129. July – August. Clarifying Gandhi’s Earth Ethics. Ashford, CT. USA. pps. 12-13, 30.